The next best thing to shooting the world's greatest handguns is reading about them. And nobody writes about great handguns like Massad Ayoob. Here, in one entertaining, photo-packed volume, are the handguns that changed firearms history. From the Colt 1911 to the latest and greatest Glock, Massad Ayoob shares his half-century of experience with the world's greatest pistols and revolvers as only he can. Whether you're a collector, a plinker, a competition shooter or simply a firearms enthusiast, you'll agree that Massad Ayoob's Greatest Handguns of the World is required reading for anyone interested in the history and development of handguns. The 1911, Colt Commander, Colt National Match, Colt Detective Special, Colt Official Police, Colt Python, Colt Woodsman, Glock, HK, High Standard Sentinel, Luger, Ruger .22 Auto, Ruger P-Series, S&W M&P revolver, S&W K-22, S&W Chief's Special, S&W Combat Magnum, S&W Model 27, S&W Highway Patrolman, S&W .44 Magnum, S&W Service Pistol (M39 to four digit models). In each chapter Ayoob also covers the "family" of each model. For example, in the chapter on the Chief's Special, the Centennial and Bodyguard are covered, and he takes you from the first model to the models of today. He is quite thorough. I would have liked to seen some other guns covered, guns he didn't cover in the second volume either, like the Ruger Security-six series, the Ruger GP100, or even the SP101. But I'm sure we all have guns we'd liked to see which were not covered. I just finished reading this book, and I have mixed feelings. I expected this to be a really great book, the kind you sit down with when you want to read something for pure pleasure. I've always been very interested in the details of guns, the history, the development, the shooting of different types, and how they all fit together in the firearms world. And Massad Ayoob has always been one of the best sources for the types of magazine articles and books that provide just that sort of warm fuzzy, pleasure-inducing information. On the one hand, you will find a great deal of this sort of information, and I do admit that certain chapters were very good. They not only left me satisfied, but gave me that ultimate feeling I get after having read something very good--the desire to go out and acquire the firearm being discussed in the chapter I've just finished reading. If you are a certified gungeek you know the feeling. When an author really does a good job presenting a specific firearm in all its glory, you can't help wanting an example in your collection. Oh, you get over it--real life might not let you acquire that gun, or perhaps you decide it's something you'll put on your "someday list." I'm not suggesting we run out and buy a gun because of an article we've just read. But if the article is that well done, we kinda sorta want to! But on the other hand, not every chapter was written to that level of excellence. Part of the problem as I see it is that the book is actually a compilation of a series of magazine articles written over time. (Most appeared in The Accurate Rifle, odd as that sounds). They are fairly current, and a couple were written just for the book. The book is copyright 2010, and there are references as late as a year or two prior to that date, so it isn't as if a number of ancient articles were dredged up and slapped together, but nevertheless, some chapters sparkle, and some simply don't. I'll venture a guess and say that perhaps Mr. Ayoob's personal preference for some guns over others influenced his writing. Of course I might also have to admit that my personal preferences for some guns influenced my own reaction to various chapters. 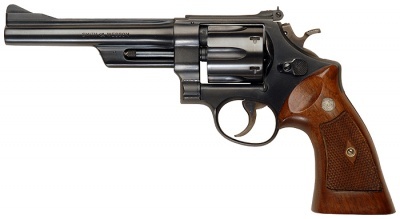 For example, I was less likely to get much of a charge out of the chapter on HK pistols compared to, say, some of the ones on Smith & Wesson's classic revolvers (of which there are several). So do take this overall perception of the book with at least a grain of salt. The book is well-written, as you'd expect from Ayoob. There are none of the language errors and typos one finds in a Patrick Sweeney book, the last Gun Digest book I reviewed, and that is satisfying. And I must add that the photography is very good. If you like good gun photos you are in for a treat. There is even a little quiz in the Military & Police revolver chapter that the reader can take to test his knowledge of this iconic model. I confess I missed two of the questions. But in the process I learned some things I didn't know. Neat. Given the reasonable price of these books from Amazon.com, BarnesandNoble.com, the GunDigestStore.com, or your local gun shop, I have to say this one is worth the price, even if I wasn't left wanting to empty my wallet or to melt a credit card after every single chapter.